Oooh Yummy salad! I can't be sure about which project of yours is featured in the book, I'm going to take a wild guess-US Air Mail 25c? Congratulations on being included in the book! It was just a matter of time...Good luck with your recovery. is yours the quilt on the fence post? i hope you heal well, i hope to get my hands on a copy of this book, my husband already knows i want it...good luck to everyone, and good luck to you, healing from a broken bone, with little ones, well wishes to you from me here in maine. How exciting for you! I'm guessing your project is that little brown and green number of there. Congrats! I would also say the quilt on the fence post :-)...why do you like fat 1/8s? The quilt on the fence post has to be yours I cant see you making one of the bags. Congrats on your first book! Glad you are done with surgery.. NO FUN! Better times ahead. Feel better soon! I've never had a fat 1/8 so don't know what they are.. but sound yummy. I can't wait to check out this book! Congrats on the successful surgery and the publication!! The recipe sounds delish - will have to try it this summer when the corn is out of this world! Congrats to being a part of the book, I'm guessing the quilt on the fence rail. Congrats on the book and glad to hear you are healing after your surgery. Thanks for the book tour and giveaway and recipe! I think yours is the quilt on the fence!? Madre ma .... ¡que lujo poder formar parte de ese libro! Estoy deseando tenerlo en mis manos. Espero que la recuperacion vaya bien. That salad sounds great! Congrats on being in this book! And how nice that yours is one of the featured quilts I'm guessing yours is the rail fence. Thanks for the recipe and a chance to win this great giveaway! The book looks fantastic! I guess your contribution is the quilt on the railing?! I hope your arm heals quickly too. How fun! Congratulations! I think your project is either the fence rail one or the star. Hope your recovery goes well! the rail fence would be my guess. what a great giveaway! I'm recovering from a broken ankle from Sept! My prayer for you is a speedy and complete recovery. Congrats on being published! Looks like a wonderful book too! So glad to hear your surgery went well. Here is to a quick recovery and less pain too! the salad sounds yummy! Congrats on being published! I know that is very exciting for you! Barley salad! My sister and I were just talking about a barley casserole we used to make often. We shall have to try this also. The big draw is on my birthday so someone should pull my name........right? Hope your elbow mends soon and completely! 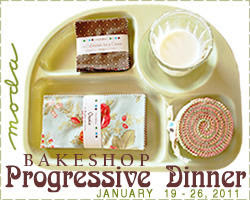 I love this progressive dinner idea because I am finding blogs I didn't know about. Like this one! My guess for your project is.... the quilt on the fence?? I would also guess the rail fence quilt is yours. All the projects look great though and I'm excited for the book! Thanks for the blog tour and recipe! glad to hear you're doing better! Your recipe sounds great - I'm going to try it! Yeah! You are being published! That is so fun! 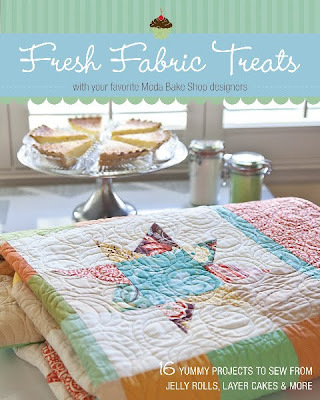 I could love to win some moda fabric! i love all the quilt blogs I'm discovering during this "dinner"! Congratulations on the book, I agree I think the one on the rail. Congratulations on being featured in the book. Congratulations on being published! The book looks like it is full of inspiration! Thanks for the chance to win. Congratulations for being in the book. Congratulations on being published. How exciting that must be!! I think that your project is the quilt on the rail - it looks like a line you would gravitate towards are you usually display your quilts on a fence or rail! The salad recipe sounds great! Yay! I love fat eighths! Okay, well I like all the precuts! Congrats on the book and hope you are done "hunting and pecking" soon! Congrats on being in the book, I can't wait to get it I love the Moda Bakery. Thanks for the opportunity. Good to see that you are on the mend, and congrats on your first book! And thank you for sharing this recipe - sounds wonderful!! I am torn between the quilt on the fence and the bag in the top right corner... both look like prime candidates for the fat eight bundles... but like one of the other ladies mentioned, not sure I can see you making bags lol. Happy quilting! Congrats on the book and hope that your surgery heals well for you! I'm excited to learn of more wonderful quilting blogs like yours through this book...I would love it! I'm thinking it's the quilt on the fence :) Glad you're feeling better, and how freaking exciting for you! Thanks for the recipes! Congratulations on being published, Bakeshop is a fantastic thing to be part of! Please enter me for the giveaway, thank you. So glad you're back and okay! I reckon the quilt on the fence too :-) I'm very excited about the book, can't wait for it to be released!! I'm thinking the quilt on the fence rail John? The dinner party has been very exciting so far, glad you have recovered enough to join us! I'm guessing yours is the one on the fence? Looks very you... Thanks for the recipe and the chance to win the book. I'm loving this blog hop thing, so much fun! Hope you are typing with both hands soon! Congratulations on having a project in the new book! Can't wait to get it!! Never too early to begin Christmas presents!! John, congratulations. This is very exciting news. I am always impressed by your projects. You are one talented guy! Glad you are on the mend. Be careful out there. Guessing that yours is the one on the fence, looks great. Glad you are healing and were able to "hunt and peck" this post. would love to see all the projects in the book, I could if I won it. Glad to hear you are on the mend, Quiltdad! Congratulations on the book feature! YAY!!! Congratulations on being published! of course you are going to be published!!! Moda Bake Shop has the best chefs!!! So happy to see you included in the book. Your photo kind of reminds me of a year book and you guys are the incoming freshman class!! You guys are a bunch of talented people. We are so lucky that you are all willing to share with us! Hope you heal up quickly!! The salad sounds good ! I guess it's your quilt hanging on the rail . thanks for the fun time and the chance to WIN !! Congrats! Can't wait to see your project and all the others in the book! SO glad recovery is going steady. A huge salad fan - this sound delightful. Congratulations on being one of the feted in the book - I can see this will have to be a "must have". Congrats on the book! I'm guessing that yours is the quilt on the deck railing. Can't wait to see the actual book! Congratulations on being published! I think you made the quilt in the upper left (with a cake on it). Thanks! I'll guess the rail fence on the railing, too:) Looks like a great book. Thanks for the chance to win! Congratulations! My guess is the star quilt. The quilt on the fence is the one I think you did. Can't wait to see the book and try your recipes. Thanks! Thanks for a very generous giveaway. Can't wait to read the book! Excellent job hunting and pecking! Congrats on the book! Congratulations on being published. I'd guess the rail fence quilt is your's. I think the quilt made from Origins must be yours, though they're all fantastic! Thanks for a chance to win. Delicious! I'm loving this progressive dinner, my recipe box is rejuvenated! Congratulations! It must be very exciting to have your design featured in the Moda book. I think your design is the quilt in the middle of the top row. Congratulations and all the best for a speedy recovery! Congrats on being featured!!! Your recipe sounds wonderful! I'm glad your surgery went well! I'm guessing your project is the quilt with the cake on top? Thanks for the chance to win such an incredible giveaway! what an honor to be in the book! congrats!!! i cant wait to get the book. I could get used to a good salad. Tell your wife this salad sounds wonderful. Might have to give this one a try. How awesome, being published - quite an honor and very deserving. Congratulations on being published in your first book! Such an accomplishment! Can't wait to see the book! Glad you are feeling better. Thank you so much for doing this. Can't wait to see the book and try all the great "recipes". Congratulations on the book and happy recovering! Looking forward to seeing your project in the new book. Hope you're back to quilting fitness very soon. Arugula is great in a salad. Hm I'm not sure which design in the photo is yours, but I'll guess it's the one in the top middle photo? Sorry if I am wrong. Anyway, congrats on the book! Congratulations, I can't wait to see the book! Hope your elbow heals quickly. This salad sounds good. I would love to win this giveaway :). I'm so excited about this book. Congrats on being part of it! Good luck with your recovery! I would love to win the book. Did you design the pillow? Just wondering. Yumm!! I would guess the pillow. i just wanted to say that i'm happy that your surgery went well. and a big congrats to you on the book. remember like 2 years ago when i said this in a email: we're gonna take over the quilting world, one step at a time...well here's one big step!!! Woo Hoo!!!! I love this progressive dinner. Congrats on being in such a great book. Congratulations on being published!! Can't wait to get the book. Thanks for the recipe, too! This book looks great - can't wait to see it. Sorry about your accident but glad to hear you are on the mend. And what a great giveaway - thanks. Congrats - This book is going to be fantastic!!! Glad you are feeling better and on the road to recovery! That book looks fantastic. I am glad to hear you are doing better. Thanks for the recipe and the giveaway! The salad sounds delicious! may just have to try that! Congrats on being published in the book! I know that must be exciting as ever! Your Off The Grid sliced nine patch is on my to-do list so I can display it next christmas, thank you for the beautiful patterns you contribute! This is a great collaboration of many great works, an exciting project. All the best with your injuries. Congrats on the book. Hope your elbow is better soon. Now, see, that's just validating--to see a guy who quilts and is proud of it--no different from a gal who's a doctor. And how many of the top fashion designers are men, anyway?? Congrats on being included in the book! I homeschool my son, and he loves to sew, btw. I'm subscribing to your blog RIGHT NOW, so he can keep up with you between reading up on the Texas Rangers ball team. Speedy recovery, too! I'm so excited for this book...such amazing talent went into this book. I think it's a must have for my collection! Congrats on being in the book-I can't wait to see it! Congrats and thanks for the yummy recipie. Glad to hear you are on the mend. The new book looks like a "must have". Thanks for the yummy recipe & a chance to win. I get excoted every time I see this book!!! I don't know how I will wait til May to get a copy! Congratulations. How exciting to be in a book. The projects I've seen so far are gourgeous. Very nice recipe! We love salad that incorporate grains, and eat them all the time! Thank you & your wife for sharing this one! Congratulations on the book! Eager to see more of it, and to know which project is yours. Great recipe. Congratulations on being included in the book! Congats! My guess is the quilt on the railing. Nice to see a man's face on that bookroll! Congrats on being published! Yummy dinner plans. Congrats on the new book. So glad you're recouping and feeling a bit better! Can't wait to see this book and so happy you made the back cover (my guess is the green quilt on the railing :)! I think it's the quilt with the cake! I am SO excited about this!!! Congrats on being published!!! Winning precuts for me would be HUGE!!! With 3 under 3 it's hard enough to get time to sew and quilt let alone cut ANYTHING out! I hope that your are healing quickly. I can't wait to see this book. Wow, Congratulations on being published and in such a very exciting book!! Thanks for the chance to win and for sharing the yummy sounding salad with us!! So cool! You make the best quilts. The book looks so great - I can't wait to get my copy!! And the salad looks so very yummy!!! I'm keeping my fingers crossed that win - something!! I'm glad you're back in action. Hope the elbow is healing well. I'm gonna bet your project is the quilt on the fence. I'm loving this! I had a friend send me your way a while ago and now I just love seeing all you do! Congrats on being published! I would love to win this give away and when I get my computer time again tonight, I'm going to the other sites. Congrats! Looks like a great book!And, mh I would guess the stars quilt..? Such a great and healthy looking recipe! I'm excited about checking out some of your projects. glad you're feeling better! congrats on the book - i can't wait to get it! Congratulations!! How exciting for you! :) Hope you continue to feel better! The book looks great with lots of great projects! Your salad receipe looks interesting?! Congrads on the book and a chance to win! congrats on the book, that is SO exciting! also, the recipe sounds delicious...must try it! What a yummy sounding salad! elbow surgery is so rough...I dislocated and broke my left elbow back in 8th grade, right at the time I was taking typing class! So I get the hunting/pecking thing. Hope getting published in this great book feels better than your elbow. Congrats of being published! I think your project is the quilt on the railing...second picture from the left on the top. Thank you for the recipe! We love cold vegetarian salads like that so we'll be trying it soon! Loved checking out your blog! Congrats on the book! I hope you are feeling better soon from your surgery. I think your project is the US Air mail pillow! or maybe the rail fence one on the fence. wow, I am out of the loop. I didn't know about your injury. Glad you got it taken care of. This recipe sounds amazing. I can't wait to try it. Thanks for the recipe and the chance to win. Hope you're feeling better soon! I know all about "hunt & peck". Can't wait to see which project is yours, but I think I have a pretty good idea! The recipe sounds pretty good also. Congrats on being in the book! That salad sounds good... I'll have to try it. I'm guessing the pillow, because I've already seen someone claim the quilt in the lower right. Congratulations and speedy recovery! I think yours is the one with the little cake... Am I right or am I right? Can't wait for the book to come out. Hope I win. I think yours is the one with the cake too. And that recipe looks fantastic! Thanks for sharing. I am loving this progressive dinner! It is so fun to have all the new recipes. Congratulations on the book! So exciting. I love this giveaway too! Oh, and I wish you a speedy recovery from your injury - been there, too. Elbows are not fun to break! Ow on the elbow! Start sketching now for the quilt you can build around the plate and screws when/if they get taken back out down the road. Congratulations! And the recipe sounds amazing! Looking at your past Moda projects I'm guessing the green and brown striped quilt would be yours. Love your projects, they are fun. Thanks and congradulations on your book! So sorry about your surgery. I am glad you are on the mend. This progressive dinner is so fun. I love checking out all the blogs. Of course, I check yours out regularly anyway. If I had to guess, I would say yours is the brown and green quilt on the fence. Thanks for the recipe. It looks delicious. I'm going to try it this weekend! The salad sounds great and I can't wait to see which project is your design. The book is very exciting as I always enjoy the Bake Shop! Thank you for sharing you work with the rest of us. Congratulation on your first publication--I'm sure there will be many more! Congrats on the book! Hopefully you have a quick recovery from your surgery! That salad sounds wonderful! I think I will pick up some arugula today. Congrats on the book and thanks for the great giveaway! Wow! How exciting is it to be published?! Congratulations! The salad sounds delicious, can't wait to give it a try. Aww, I'm sorry to hear about your arm, but I'm glad you are doing better! :) praying your recovery continues to go well and you have a full healing very soon! I hope you heal well and can get back to quilting soon. I guess the striped block quilt is yours. Can't wait for the book. Thanks for the chance to win! 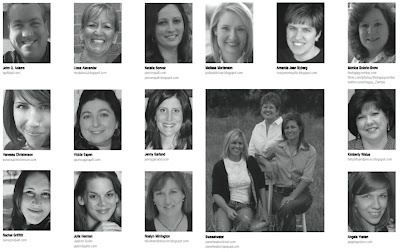 Many of my favorite bloggers are in the book! This book looks awesome. Great giveaway! How exciting! Congrats on your first publication! Thank you for the giveaway! Sounds like a great recipe to try! Congratulations on being featured in the book! Thanks for being part of this fantastic giveaway! Your 'recipes' on the Bake Shop are some of my favorites - easy enough for me to do, but challenging enough to keep me interested! Keep them coming! How delicious! And how exciting for you to be published for the first time! Good for you! Can't wait to see the book! I'm guessing it is the Origins quilt. Hope you have a smooth recovery - really makes you appreciate that other arm, right? Thanks for sharing your talent with all of us! Congrats on being one of the chefs. I can't wait to check out the new book to see what you baked up! I've copied and pasted this recipe...I think it would be delicious after I substitute something for the feta. 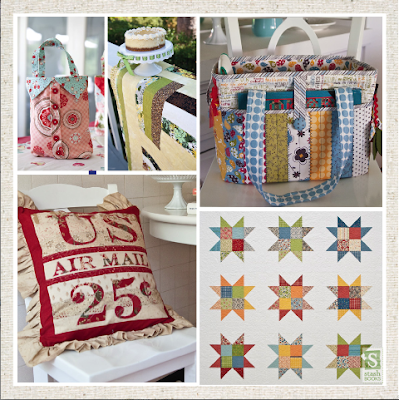 :) I think your project is the quilt, and I'd love to win the book! Congratulations on being included in Moda's book. I love your work! The salad looks great; I'll give it a try. Thanks for the opportunity to be included in your drawing. Congratulations on being published. The recipe sounds delicious. Feta is one of my favorites. My dad still uses the hunt and peck method for typing and he was the computer teacher. Congrats on being included in such a wonderful book. Way to go! Your first pattern in a book is a big milestone. Thanks for the recipe. Can't wait to see everything in the book. I enjoyed your blog..recipe and quilts too..I'm glad you're part of the new book. Congratulations on the book. Your designs are great, you deserve the recognition. Congrats on the book! I hope your arm heals quickly! That recipe sounds so good. Tanks for the chance to win the book. OMG John, I read about your elbow accident, and hope you will heal quickly! Thanks for sharing a family favorite recipe and for your creativity in patterns. Glad someone from NC is in the book!!!! Love your blog and a chance to win the BOOK! Keep up the great job and congrats on the book!